* Only apply if you can attend all dates. Significant financial resources are invested in each participant and only those who can attend and benefit from the entire program experience will be accepted. 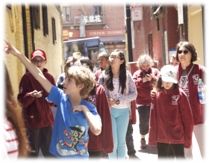 The Mandarin Institute in collaboration with the San Francisco Unified School District (SFUSD) and STARTALK will offer a unique opportunity for ALL Middle School Immersion students and High School students with a minimum of 1.5 years of formal Chinese study to immerse themselves in a culturally rich and academically intensive Mandarin program. The instruction is task-based and student-centered. An immersion and multi-sensory language environment will be created to maximize the students’ exposure to Chinese language and culture. Each day, students will participate in 6.75 hours of engaging language and culture study. A very exciting feature to the program is that every student will spend 40 minutes daily online with their own personal instructor situated in China engaged in an authentic cultural learning experience that will enhance their language learning. After Feb 15th all applications are processed in the order they are received. Application Deadline: Register early because we have limited spots. Registration will close when the program full. If your child has attended the program previously, please note that priority registration is given to students who have not yet had the opportunity to attend. or download the form below for your teacher to complete. Please contact info@MandarinInstitute.org with any questions.